Upscale residential neighborhood Windsor Park Estates is home to some of the most expensive real estate in east Katy. Located within Katy, one of Houston’s best suburbs, Windsor Park Estates is a relatively small residential community known for its luxury homes and tree-lined streets. 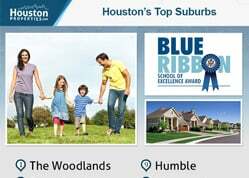 TOP RANKED SCHOOLS: The Katy ISD is renowned for having some of the Best Schools in the Greater Houston area. Windsor Park Estates features three multi-award winning schools: Pattison Elementary, McMeans Junior High, and Taylor High School. LUSH NEIGHBORHOOD: Built adjacent to George Bush Park, Windsor Park Estates embraces its verdant surroundings. It is known for its tree-lined streets and mature trees. LUXURY ESTATE-STYLE HOMES: Rivaling the Most Expensive Homes In Houston, Windsor Park Estates real estate are some of the most gorgeous in the Greater Katy area. Its estate-style homes offer luxury amenities like swimming pools, landscaped grounds, spacious living areas, and sweeping staircases. BUSINESS AND EMPLOYMENT CENTERS: Nestled in the area a few miles east of Houston’s Energy Corridor, Windsor Park Estates homes are minutes away from major employment hubs. Main roads and freeways like Fry Road, Baker Road, Kingsland Boulevard, and Interstate 10 are all minutes away from the neighborhood. STRONG REAL ESTATE MARKET: Windsor Park Estates is part of the Greater Katy area. Katy’s real estate market has been one of the best performing suburban Houston neighborhoods over the past one, five and ten-year periods. Due to low inventories and high property values, Windsor Park Estates real estate can be tricky to navigate. 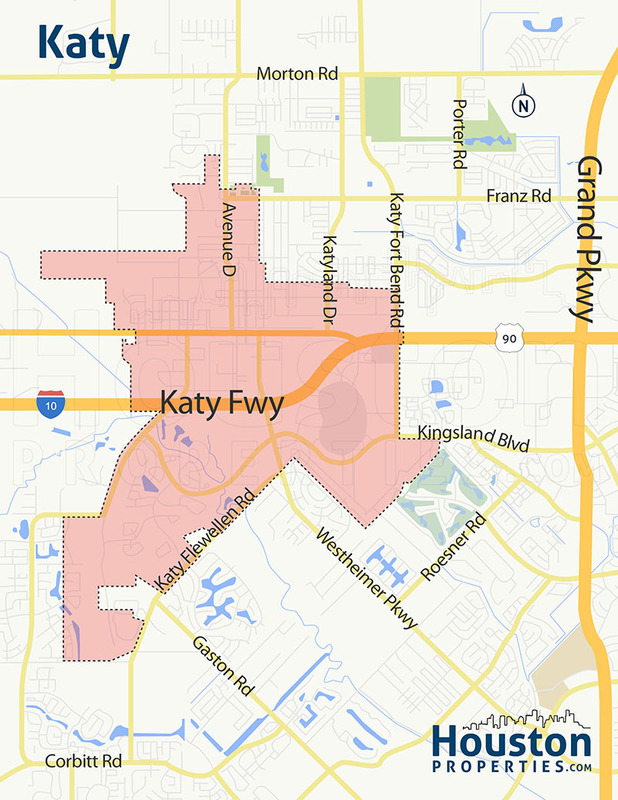 The general Katy area is also one of the largest suburban area in Houston. Consulting with the best Windsor Park Estates Katy realtor can greatly benefit homebuyers. For any inquiries about Windsor Park Estates homes recommendations, or off-market MLS listings, get in touch with Paige Martin, head of the Houston Properties Team and one of the best realtors in Houston. I am interested in Windsor Park Estates and would like to get more details. Located about two miles west of Houston’s Energy Corridor, Windsor Park Estates is an upscale residential community. The Katy ISD is renowned for having some of the Best Schools in the Greater Houston area. Windsor Park Estates features three multi-award winning schools: Pattison Elementary, McMeans Junior High, and Taylor High School. Built adjacent to George Bush Park, Windsor Park Estates embraces its verdant surroundings. It is known for its tree-lined streets and mature trees. Windsor Park Estates real estate are some of the most expensive in the Greater Katy area. As the name suggests, the neighborhood features estate-style homes with luxury amenities like swimming pools, landscaped grounds, spacious living areas, and sweeping staircases. Nestled in the area a few miles east of Houston’s Energy Corridor, Windsor Park Estates homes are minutes away from major employment hubs. Main roads and freeways like Fry Road, Baker Road, Kingsland Boulevard, and Interstate 10 are all minutes away from the neighborhood. Retail and entertainment areas are also nearby. Schools, restaurants, parks, golf courses, and hike and bike trails are easily accessible from Windsor Park Estates homes. The neighborhood shares community amenities with adjacent Green Trails. Residents can enjoy a swimming pool and tennis courts on the northeast corner of Fry Road and Greenwind Chase Drive. The upscale community also features a fountain park within its borders. Windsor Park Estates has an active homeowners association and deed restrictions in place. Homes in the area were built between 1990 and 1999. Windsor Park Estates real estate are known for their sprawling lots, large by Houston standards. Lot sizes range from 12,000 to more than 30,000 square feet. Windsor Park Estates homes are very spacious, offering between 3,500 and 6,000 square feet of living space. Windsor Park Estates homes are mostly custom-built two story homes. Others are bunglow and ranch-style homes. Prices for Windsor Park Estates homes for sale start at around $500,000. Some of the neighborhood’s most expensive homes tend to sell for more than $1,100,000. Windsor Park Estates is an upscale residential neighborhood in the Greater Katy area, one of Houston’s best suburbs. The community is within the area south of Interstate 10, east of Grand Parkway, west of Highway 6, and north of Westpark Tollway. 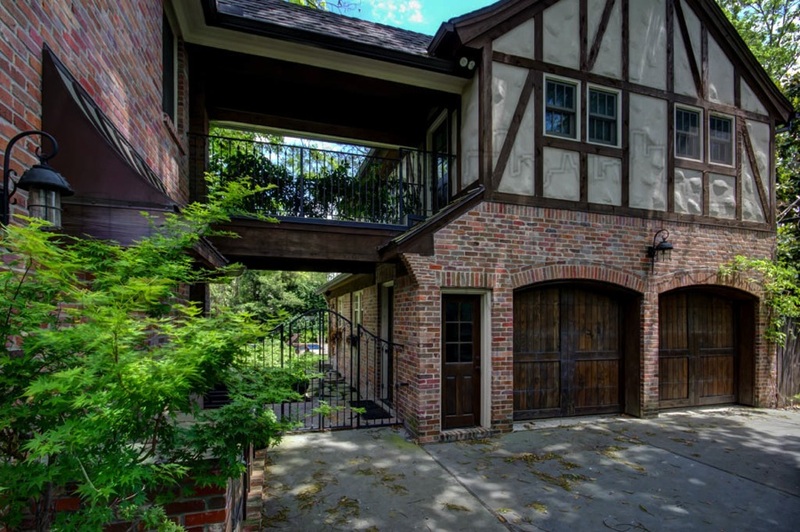 Windsor Park Estates sits on both sides of Greenwood Chase Drive. Windsor Park Estates was under Academy Development, the company also responsible for Marcello, a new construction master-planned community in southeast Katy. Developed in two sections, Windsor Park Estates features long, tree-lined streets, and large wooded lots. Other communities nearby include Kelliwood, Green Trails, and Windsor Park Lakes. Thanks to its location just west of Barker Road, Windsor Park Estates homes have easy access to the area’s main thoroughfares. S Fry Road, Kingsland Boulevard, Interstate 10, Grand Parkway, and Highway 6 are all within comfortable driving distance from the neighborhood. Key districts like the city of Katy and the Energy Corridor are both about 7 miles away from Windsor Park Estates homes. 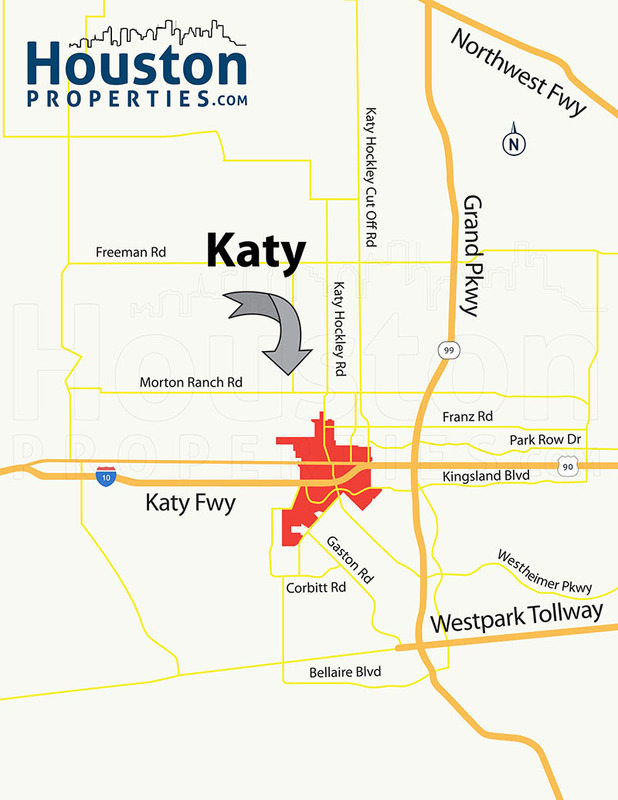 The city of Katy is about 6 miles west of Windsor Park Estates. Windsor Park Estates homes are zoned to Katy Independent School District (KISD). Two National Blue Ribbon Schools serve Windsor Park Estates homes: Pattison Elementary and Taylor High School. Children at Risk named McMeans Junior High School 7th in their 2016 Greater Houston School Rankings. Pattison Elementary School at 19910 Stonelodge Drive. Hazel S. Pattison Elementary School is home of the Colts, and is one of the KISD’s National Blue Ribbon Schools (1993-94). Pattison offers excellent academics and special programs (ESL and gifted and talented). McMeans Junior High School at 21000 Westheimer Parkway. Named for a former KISD administrator, Garland McMeans Junior High School features Pre-AP, Gifted and Talented, ESL/Bilingual, and special education programs. It also offers a great variety of athletics programs and extracurricular activities. Taylor High School at 20700 Kingsland Boulevard. The second high school to open in the KISD, James E. Taylor High School first opened in 1979. Since then, it was named National Blue Ribbon School (1994-1996) and TBEC Honor Roll School (2003). The TEA has given the school an Exemplary rating multiple times. The following are some of the more notable private schools near Windsor Park Estates homes. 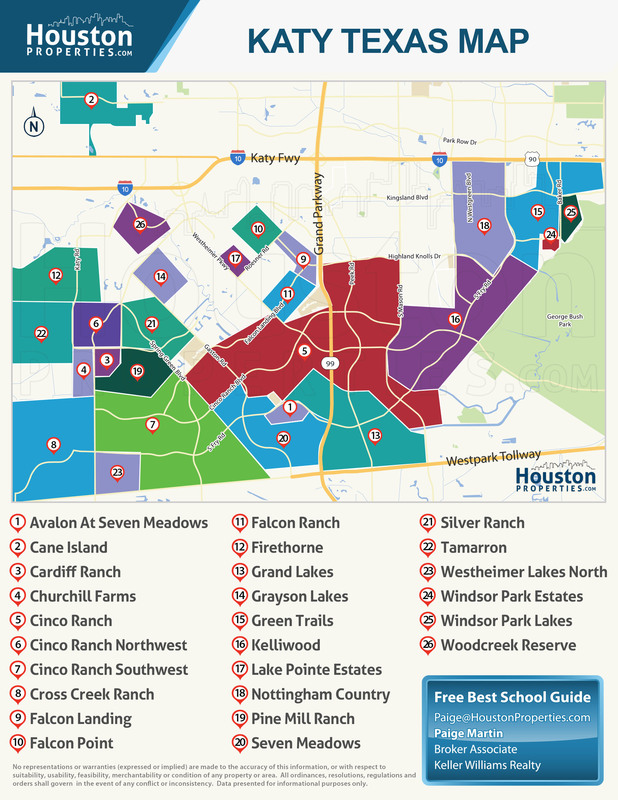 To find an updated listing of all Windsor Park Estates real estate zoned to any specific public school, please send an email to Paige Martin at Paige@HoustonProperties.com with the property preference and budget that you’re working with. Like nearby Windsor Park Lakes, Windsor Park Estates features some of the more expensive homes in the Greater Katy area. The median sales price of homes in the neighborhood peaked at just a little over $1,000,000 in 2013. Windsor Park Estates real estate is highly popular for its high performing schools, accessibility to key areas, and beautiful luxury homes. The median sales price clocks in at over $800,000, and despite fluctuations, property values in the area remain steady. Only a handful of Windsor Park Estates homes are put up on the market every year. Apart from the low inventories, other factors also contribute to Windsor Park Estates’ strong property values, including its deed restrictions. 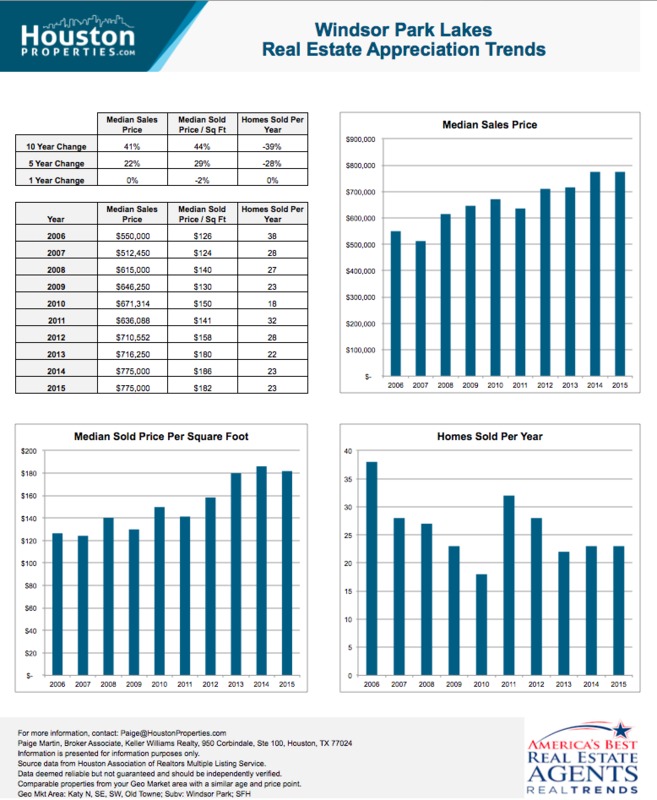 For updated information regarding Windsor Park Estates real estate pricing and trend analysis, please contact Paige Martin at Paige@HoustonProperties.com. Windsor Park Estates real estate are typically luxury homes on sprawling lots. 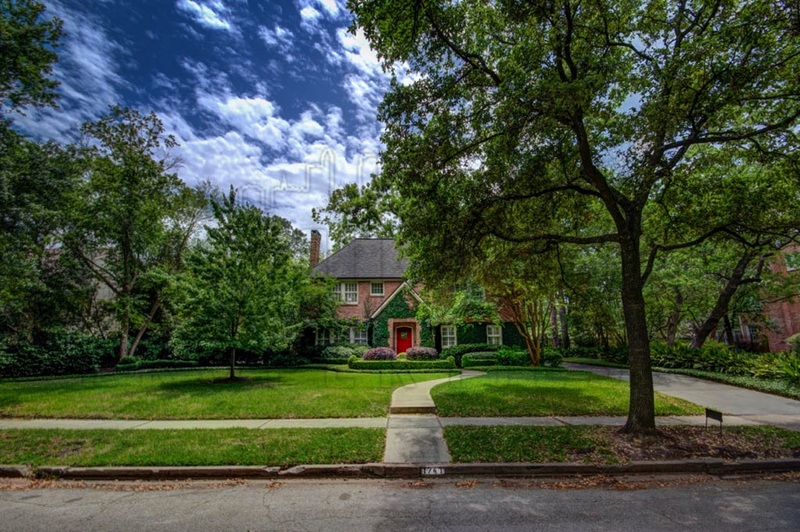 As the neighborhood’s name suggests, estate-style homes are the main housing attraction. Each home showcases elegance and affluence. Swimming pools, beautifully landscaped grounds with mature trees, oversized multi-car garages, and sweeping staircases adorn most Windsor Park Estates homes. Homes in the neighborhood are custom-built, with 4- to 6-bedroom floor plans. Living spaces range from 3,500 to more than 6,000 square feet. Lot sizes come at a generous 12,000 to more than 30,000 square feet. Like most neighborhoods in the area (Green Trails, Windsor Park Lakes), Windsor Park Estates was developed during the early to mid-1990s. Architectural styles lean toward traditional aesthetics, with brick and wood exteriors. Windsor Park Estates homes for sale start at around $500,000. The neighborhood’s most expensive homes can fetch more than $1,1000,000 on the market. There are no Windsor Park Estates condos for sale. There are a few mid- and high-rise residential buildings in nearby Houston districts like the Energy Corridor and Memorial. A number of key events contributed to the development of subdivisions like Windsor Park Estates: the establishment of the MKT Railroad, the construction of the I-10, and Houston’s post war housing boom. Most of what is now known as the Greater Katy area was part of the Stephen F. Austin Colony. Parcels of land changed hands over the years, most of which were used as working cattle ranches and farmland. The town of Katy, named for the Missouri-Kansas-Texas Railroad (the “KT”), was founded in the late 1890s and was incorporated in the mid-1940s. During the 1940s, some areas around the Buffalo Bayou were designated as a reservoir and park. Later, the park was renamed George Bush Park. Some years later, Houston’s housing boom and the completion of Interstate 10 in the 1950s and 1960s drew development to the areas west of the Bayou City and east of the city of Katy. Most subdivisions adjacent or near the George Bush Park (Green Trails Park, Windsor Park Estates, and Windsor Park Lakes) were developed during the 1980s and 1990s. Today, Windsor Park Estates remains one of the most desirable places to live in the Greater Katy area. Its exemplary schools and location near the Energy Corridor draws homebuyers to the community. Custom-built luxury homes (most of which have been updated) still line its tree-canopied streets. Windsor Park Estates homes have a 7,800-acre park next door, a shared community center, and a fountain park. Residents can also enjoy having some of Katy’s best retail, entertainment, and dining within minutes of their homes. George Bush Park, located adjacent to the neighborhood, features a number of sports facilities (softball, baseball, and soccer), as well as miles of hike and bike trails. The park also offers playgrounds, pavilions, and a shooting range. Also, model aircraft hobbyists will surely appreciate the park’s field for model planes. For other pursuits, residents can enjoy the community center it shares with Green Trails. The residents-only center has two tennis courts and a swimming pool. The Windsor Park Estates Fountain Park is closer to home, located on Foxtree Lane and Windsor Park Drive. For retail, there’s Katy Mills Mall, LaCenterra at Cinco Ranch, and Westgate Market Place. Golfers, whether low handicappers or beginners, can enjoy the Carlton Gibson-designed, daily fee Golf Club at Cinco Ranch. The Meadowbrooks Farm Golf Course is further southwest, but is also a good option.